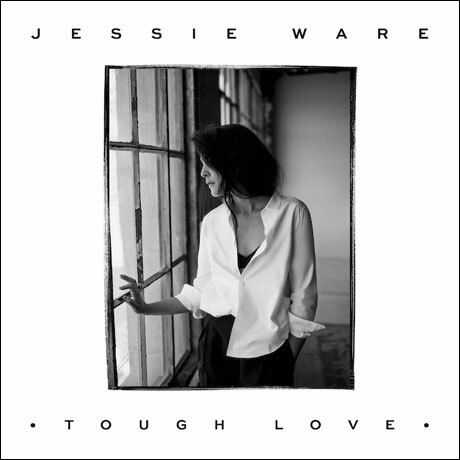 British pop singer Jessie Ware recently previewed her impending sophomore album with the single "Tough Love," but she neglected to share any information about the LP. Now, she's revealed that the preview song was in fact the title track to Tough Love. That's the album cover above. It's stylistically similar to the single artwork, but uses a different photograph. Ware has yet to confirm a tracklist or release date for the album. In the meantime, watch the previously unveiled video for "Tough Love" below. She told Pitchfork that contributors to Tough Love include Miguel, Simian Mobile Disco member James Ford (Arctic Monkeys, Klaxons), Drake cohort Nineteen85 and songwriter Ed Sheeran, as well as returning collaborators Dave Okumu, Julio Bashmore and Kid Harpoon.